This was a great game. Longton are at the wrong end of the table but more than contributed to this occasion, writes Sean O'Brien. In fact it was them that took the game to Newbold with a score in the second minute of the match. Newbold’s fringe defence was left on the bus. Longton put out one of the biggest packs Newbold had played against this season, and there was plenty of experience in there as well. I’m sure one of them was ex Great Britain shot-putter Geoff Capes (google it if you’re young). Newbold responded with a Joss Thompson lineout win, a Stuey Houghton burst and a finish by Sam Thompson. The conversion made it 5-7. Longton went down to 14 men and remarkably proceeded to score two tries, the first from a lineout set move, the other on the left wing after some nice rugby. From a Newbold set move from a scrum, dangerous Manny Sidhu ghosted over untouched. Then Sam Thompson broke loose to put in big bro’ Ben. 15-21. Sam Thompson then tapped and went, Jamie Mapletoft scored, 15-28. It was ‘the Sam Thompson Show’ after the first quarter. He wrapped up ‘Man of the Match’ early. Front five players Ben Dawes, Stuey Houghton, Ben Thompson, Nick Walton, Duzza Ziba and Ben Nuttall grafted to win ball against their hefty old opponents. ‘Un-hefty’ Joss Thompson played his part also, winning lineout ball and linking the play nicely. Ben Dawes had a ball running over defenders that he couldn’t run through. From a lineout Phil Reed was put through to score his umpteenth try in the last few seasons. 15-35. In the second half Newbold had the wind and all the territory, choosing kicks to the corner rather than shots at goal. ‘Bold varied things up a bit as well, using Dan O’Brien bombs to good effect, which Longton struggled to field in the sun and stiff breeze. Longton lost their equivalent to France’s giant centre Matthieu Basterau to a second yellow (therefore red) card, which opened up some gaps for Newbold to try and exploit. Duzza Ziba made a burst, still smiling, passed to workhorse Connor Gallacher who fed Phil Reed who then delivered the scoring pass to Oisin McKenna. This made it 15-42 and game over. But Longton never threw the towel in and scored two late tries themselves in a mayhem last 10 minutes where Newbold went down to 12 men for a while. The sin bin was bursting. Lee Lightowler benefited from another Sam Thompson assist. Dan O’Brien missed just one kick, the score finished 29-47. 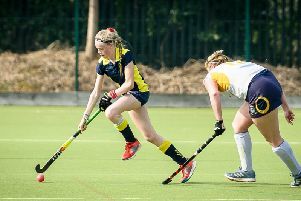 Malvern are the opposition next week. 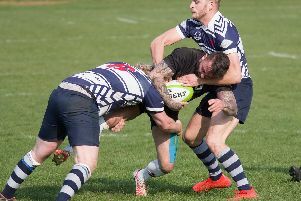 Newbold need bonus point wins to keep their wafer thin play-off hopes intact. It’s Vice Presidents Day next so the lads had better play well to avoid being told how good the old boys used to be. Ah that’ll happen anyway, it’s fine. It’ll be their turn in 20 years time.